President Abraham Lincoln first shared with his entire cabinet a draft of what would become the Emancipation Proclamation on July 22, 1862. His plan received a mixed reception among his advisers given the dire times in which the administration faced. When teaching about the Emancipation Proclamation, the dynamics surrounding the processes leading up to the enactment of the executive decision can be harnessed to make relevant an engaging history lesson. We all have at least one. We all have a pet fallacy that, despite wide acceptance, in nonetheless false, wrong and downright dumb if you think about it. For me, the proposition that an entire population perceived some monolithic understanding of any issue ranks second highest among my several peeves relating to history. However, the teaching of history in such a way as to promote this form of decidedly poor thinking has a place of contempt all its own in my collection. History lessons always provide opportunities for training students how to think better and the Emancipation Proclamation offers a particularly fertile topic for this purpose. The Emancipation Proclamation was treated by multiple reactions from all quarters at the time it became known. The closest response to a single mindset was from the Slave States, but the viewpoints between border states not in secession and those in revolt were certainly different for obvious reasons. In the Northern States, there was no shortage of white supremacists even among the ranks of abolitionists. The may not have approved of slavery, but they did not accept any concept of racial equality. While the Emancipation Proclamation did not bestow equality, it was seen by some as a venture into troublesome territory where blacks might presume future elevation in status. So what factors led Lincoln to issue the Emancipation Proclamation? Leading students to understand three influencing components, two political and one military, effectively promotes higher learning on a topic not well comprehended by many adults. 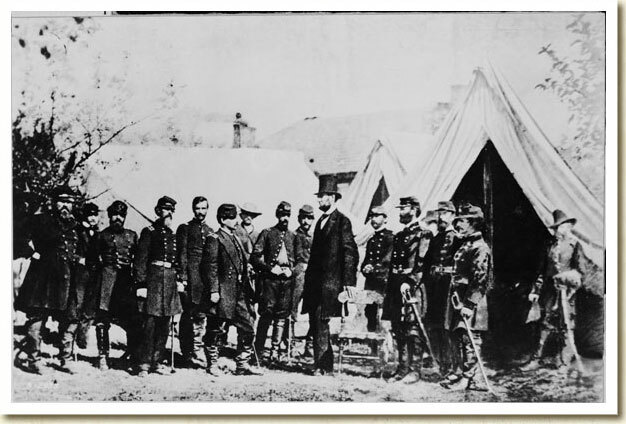 The fall of 1862 was not only a time of military concerns, but of political calculations. The mid-term elections loomed roughly six weeks ahead of the preliminary announcement of the Emancipation Proclamation. Many of Lincoln’s advisers and fellow Republicans feared that a perceived shift in the war’s focus from preserving the Union to a precursory move to end slavery might cost Republicans seats and possibly control in Congress. The main threat came from those who were openly talking of a negotiated peace with those states in rebellion, a negotiation based in part with guarantees of the continuation of slavery. Until the slaughter at Antietam, nearly equal to that of the Confederate victory of Second Bull Run earlier that summer, but fought over three days, the general public had not seen such horrific loss of life in a single day. Also before Antietam, Union victories were relatively scarce, though most of the blood-letting had been done on Southern soil. One of Lee’s main objectives for invading the North was to expose the civilian population to having war fought on their doorsteps. 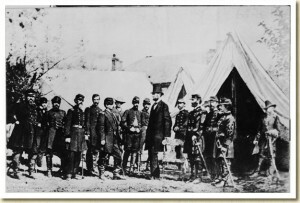 Despite having his plans thwarted in Northern Maryland, a border state due only to to Lincoln’s constitutionally questionable occupation of the state’s capital and major cities, the populous state of Pennsylvania’s citizenry fully realized the proximity of warfare which would come the following year. These political risks were weighed by Lincoln in light of several likely political scenarios. In the event of significant losses in the mid-term election of November, the peace advocates might bring to a close the military action against the states in rebellion. Perhaps as a hedge against this very real possibility, Lincoln avoided the issue of freeing slaves in the border states or in those areas of the South already under Union control. The weighing by students in both moral and political terms is a promising point of discussion by students. They come face to face with the exact problems Lincoln faced when deciding on whether or not to issue his now famous proclamation. A critical goal of the Confederacy was to secure diplomatic recognition by one or more European nations, Great Britain in particular. To that end, Southern influence had already won a small, but significant political victory over the North by England’s declaration of neutrality concerning the Union’s blockade of Southern ports. In what would later prove to be a disastrous decision, the South withheld its cotton from export in 1861 in hopes of hastening recognition by Great Britain, the major consumer of American cotton. Though powerful forces in Great Britain were intent upon official recognition of the Confederacy, anti-slavery sentiment would never allow government to recognize a nation inextricably tied to the institution of slavery, a practice the English had abolished decades earlier. Though Great Britain continued to provide material aid to the South, the issuance of the Emancipation Proclamation effectively countered all serious diplomatic hopes of the South. Against the uncertain political climate of late summer 1862, Lincoln recognized that every slave’s toil on behalf of those supporting the uprising equated to the availability of men for Lee’s forces. Denying the South of its major source of labor would tip the balance forevermore back to the North which enjoyed industrial and manpower superiority over the Confederacy. It was Lincoln’s fervent hope that word of the Emancipation would result in a growing exodus into the Union lines of newly freed slaves from the South. In teaching about this anticipated benefit – that never materialized to any significant degree – allowing students to brainstorm the reasons why Southern slaves freed by the Emancipation Proclamation did not flee in great numbers affords a powerful means for student to support reasoning with factual evidence. I’m quite a fan of the jigsaw method of teaching a broad or complex topic or unit. Given the ample number of perspectives, intended goals and conflicting responses towards the Emancipation Proclamation, the jigsaw method seems highly appropriate. As one of many appropriate combination of topic groupings, divide students into a half-dozen groups of four or five members each. I recommend that three of these groups cover the two political and one military consideration of the document as described previously. For the remaining three groups, focus on responses from such perspectives as that of Frederick Douglass, border states, and of course, the viewpoints among the states then in rebellion. Each group should begin by reading the actual text of the Emancipation Proclamation. After assessing for a solid comprehension of what the document did and did not do, have each group research the topic assigned and produce a short summary. Again, after assessing for evidence of good analysis in the summaries, reform four groups comprised of members from each of the initial six research teams. Provide the members with copies of all summaries and then task each of the four reformed groups with producing a cohesive synthesis of all perspectives with each point supported with factual evidence. Expect passionate responses. Following presentations by each group to the combined class, conclude this unit with a structured debriefing. During this final discussion, challenge the students, each according to his or her aptitude, to relate what was learned about the Emancipation Proclamation to any present day issue involving ideological, though not necessarily violent, confrontation. The value of investing time on this important document and affiliated history will be realized by faster – deeper – comprehension of future events. By intentionally placing students in the frustrating place of approaching a topic from multiple, sometimes contradictory vantage points you prepare these scholars to be better equipped independent learners, the ultimate goal of great teaching.